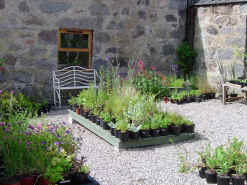 Corry Croft Nursery is a small, friendly plant Nursery based in Pittentrail, Rogart, Sutherland. The Nursery specialises in grasses and hardy plants. Bamboos, willows and vegetable plants are also on offer. All plants offered for sale are propagated at the Nursery. All hardy plants are grown on site and are therefore known to cope with the climate and conditions prevalent in this part of Scotland. I am happy to offer free advice on suitable plants for your garden when you visit the Nursery. Garden or border designs are also undertaken, please see the Garden Design page for more details. The Nursery catalogue is not exhaustive and does not contain many of the plants that may be presently being trialled. The catalogue is divided into a number of sections but please note some plants could easily be included in more than one section. Polytunnel Courses: I can run these courses during the main vegetable growing period - please check the Polytunnel Courses page for details. I also teach in colaboration with the Lairg Learning Centre, please check their Facebook page for details of courses. 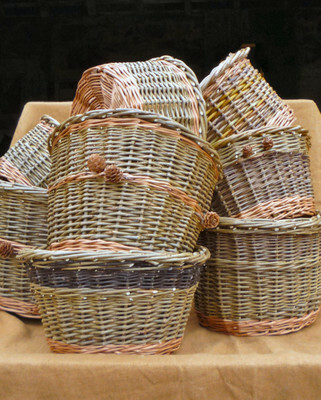 Attractive and useful traditional willow baskets are available in various sizes for the home and garden. Simple French and English randing is used to display the natural qualities and colours of the willow, occasionally combined with hedgerow materials like larch cones. Small work baskets attractively display and keep handcraft materials together. Larger pot baskets can be used for plant containers or holding vegetables for the kitchen. Mail order is offered for small plants only, due to postage costs. All plants are propogated at the Nursery and small plants are usually available from late April onwards. Availability may be limited for some plants so please 'phone or email before submitting an order.